These are not the best of times for Peruvian novelist and Nobel laureate Mario Vargas Llosa. A liberal on continent mostly ruled by demagogues who pay lip service to whatever ideology is in vogue, the writer has sought refuge in Madrid from where he frequently admonishes Latin American politicians for their lack of moral rectitude. 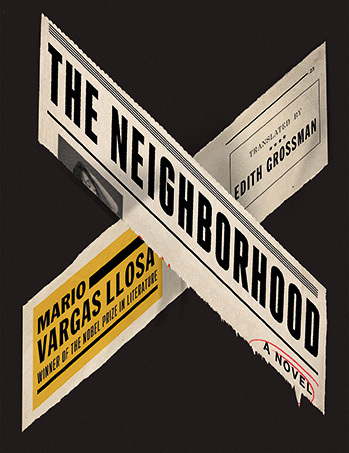 In The Neighborhood, the 2016 novel that has now been translated into English, Mr Vargas Llosa dissects Peruvian society in order to display its many vices. The plot is set in 1990s Lima, a stage so anarchic it almost transcends the Latin American penchant for chaotic surrealism. As then-president Alberto Fujimori evolves into the caricature of a caudillo (strong man) and emits edicts increasingly detached from the grim reality of a disintegrating society – beset by Maoist rebels, an sputtering economy, and a restless population – Mr Vargas Llosa paints a sombre picture of protagonists caught up in strife and duplicity, betrayal and retribution. Though the story moves haltingly and at times seems to wander off into dead ends, the novel leaves little room for ambiguity or guesswork. Mr Vargas Llosa’s villains have no saving graces; they are all bad – and rather flat. Taking a cue from the satirical The Bonfire of Vanities (Tom Wolfe, 1987), a disconcerting number characters discover that wealth, even of the unfathomable kind, offers scant protection against political expediency. Down into the gutter or grave they go – one after the other in a sequence as predictable as inevitable. A work of fiction, The Neighborhood at times reads as a settling of scores. Mr Fujimori did Mr Vargas Llosa – and Latin American literature – a great favour by defeating the writer in the 1990 presidential election. Mr Fujimori duly became president only to proclaim himself dictator two years later in a novel self-coup (autogolpe). In 1995, he claimed a second term in office in a highly questionable election. Tinkering with the constitution as well as the ballot box enabled Mr Fujimori to run – and win – for a third time. The international community failed to show up for his inauguration in 2000. By now, the president’s many dark dealings had started to catch up with him. Whilst on a state visit to Brunei, Mr Fujimori refused to travel home, flying to Tokyo instead from where, after some prodding, he sent in his resignation by fax. The Neighborhood tries to capture in words the string of absurdities that was the Peru of the 1990s. It fails rather miserably – and surprisingly. Mr Vargas Llosa seems to have lost his touch to describe incredible realities by proxy. As Gabriel García Márquez, in many ways Mr Vargas Llosa’s nemesis, has shown, Latin American reality can best be synthesised via surrealism. Any other approach invariably falls flat. The Neighborhood almost represents a tiresome I-told-you-so: the author seems to revel, perhaps unwittingly, in a certain glee that things went horribly wrong once he had left the political arena. But Mr Vargas Llosa must surely agree to let bygones be bygones: his erstwhile opponent Alberto Fujimori was only last year released from prison on humanitarian grounds after serving ten years of a 25-year sentence. Mr Fujimori, in a delusional state of mind, returned to Peru from his self-imposed exile in 2005, expecting a hero’s welcome. As it happened, he was arrested during a stopover in Chile and extradited in 2007 to face trial in Peru. As a statement of folly and deceit, The Neighborhood offers a disappointing read. However, should the reader attempt to apply a bit of colourful imagination to the plotline, a more realistic – and absurdly outrageous and entertaining – picture may emerge that approaches Peruvian realities a bit closer than the book does.